While I’m not a huge sushi fan, this stuff does look good enough to eat! 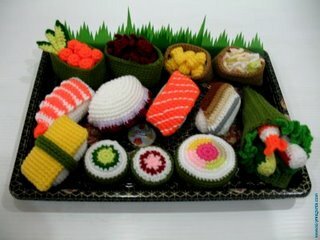 There’s lots more crocheted food at this site. Check it out! No calories involved – except those expended crocheting. No, Monica Burnett has not hyjacked my blog! It’s just that I love the look of her website and wanted to share!